It was a stellar week at Madison+Main and I was fortunate enough to eat lunch outside of the office every day this week. When I started Madison+Main in 2005, a good friend and business mentor from California sent me a book called Never Eat Alone: And Other Secrets To Success, One Relationship At A Time by Keith Ferrazzi. I pulled that book out last week, tossed the Ramen Noodles aside and realized that I had been eating lunch on my desk far too frequently. In an age where we are overloaded with instant electronic communication 24-7, it is good to get back to basics and talk to people, face to face. Thanks to Stephen, Stuart, Susan, Suzanne, Dean and Jeff for “lunching” with me this week. Another piece of business advice I’ll throw at you this week is to “network for a cause” and on Wednesday, December 4th at 5:00 o’clock at Halligan’s (West Broad Village), my friend Bobby “Aflac” Kelland is hosting a networking benefit for those affected by Typhoon Haiyan. The monies raised that night will be sent to the Red Cross and to the Filipino-American Association of Central Virginia. I’ll be there and I hope to see you that night. Monday (11/18) – On Monday, between media planning for 2014 and editing web copy for Kambourian Jewelers’ new website, I conducted short interviews with every single employee. Occasionally and randomly, I set aside a few hours and bring in team members one by one and ask them three questions: 1) What do you like most about working here? 2) What do you like least about working here? And 3) How do I fix #2? The answers always amaze me and allow me to take the pulse of the company. The verdict this week? Madison+Main has a strong heartbeat. The Sharks won the CQL Northern Division Championship last week in overtime, 6-0, over Woolridge. On Saturday, November 23rd at 11:00am Jack and his team take on the South Champion Wells Warriors at the old Clover Hill High School. Wednesday (11/20) – On Wednesday, we celebrated Client Appreciation Day (a holiday we made up in 2007) by delivering stuffed martini shakers – with the Madison+Main logo of course – to all of our clients. 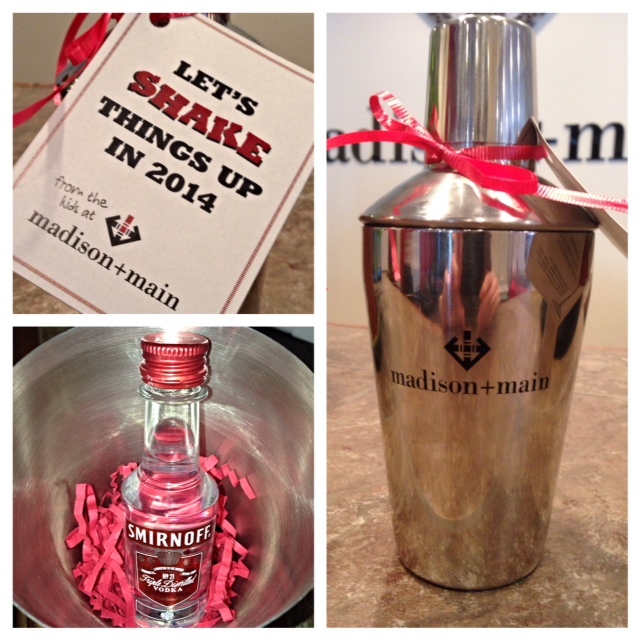 The note said, “Let’s shake things up in 2014.” Clever, right? On Wednesday evening, Molly Quarles our VP of Operations and I attended the Greater Richmond Chamber’s Annual Dinner “Impact Awards”, where we cheered on Account Executive Sarah Murphy, who presented this year’s YP Workplace Award (Madison+Main won the 2011 YP Workplace Award as the best place to work for young professionals in the Richmond area). We were also very proud that our friends at Rainbow Station and Care Advantage were both named finalists for the Impact Award. Thursday (11/21) – On Thursday, I spent the first half of the day with a great group of CEOs at my monthly Virginia Council of CEOs Roundtable Session and was impressed with my friend JJ White’s new office digs. JJ is the Chief Engagement Officer at Dale Carnegie Training. For more information about how to get your people to peak performance, visit: www.va.dalecarnegie.com. VP of Brand Strategy Kara Forbis drove two miles under the speed limit up the I-81 to beautiful downtown Strasburg, Virginia, where she coordinated a daylong series of photo shoots for one of our favorite clients, First Bank. The journey from Blacksburg to Strasburg normally takes three hours, but Kara “Lead Foot” Forbis always seems to make the trip in half the time. On Thursday night, my beloved VCU Rams got spanked by Florida State. It was the first game all year that Lindsey Durfee did not attend. Yes, I know the game was played in Puerto Rico and it would have been difficult for her to fly down to Sunny ole’ San Juan. I’m being superstitious, but I do blame her for the loss. Friday (11/22) – This morning, Client Services Coordinator (and part-time Photographer)Marie Sicola turned our conference room into a photo studio and snapped away at the Madison+Main-iacs as part of our annual Christmas gift. Shh! It’s a secret, but you’re going to LOVE it. Take a look at some of the wild and wacky things we’ve given away for Christmas in years past here. Special thanks to Jeff Moore and Troy Scott, our friends at 93.1 The Wolf, for treating us to lunch at Baker’s Crust. This afternoon we traveled to Ashland, aka “the Center of the Universe,” to meet with our good friends at Howell’s Heating & Air. We talked about their 2014 plan. Did you know that Howell’s is the official sponsor of the Stony Point Fashion Park outdoor skating rink? During the holiday season, drop by Stony Point and take the kids ice skating. The rink opened up on November 9th and will run throughout the holiday season, click here for more details. I’m looking forward to an exciting weekend, especially tomorrow’s CQL Super Bowl. Seriously, this is the last game of the year and I invite you all to come down. Remember, CQL football is MUCH more exciting than NFL football.